CSDTech tries to stay on top of new learning technology and software available on the market. We are always eager to explore promising software and applications to make sure our students have access to the latest and greatest. This past Fall 2016 semester CSDTech piloted a software called Sonocent Audio Notetaker. Students were sent out with Sonocent installed on their computers to tackle the always challenging task of notetaking. The feedback has been very positive from the students who were using the software. Moving forward CSDTech plans to purchase Sonocent Audio Notetaker providing our students with more technology-based notetaking options! What is Sonocent Audio Notetaker? 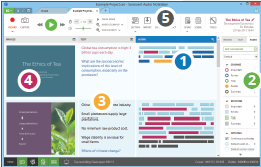 Sonocent Audio Notetaker is a notetaking software that utilizes many valuable study features. Audio Notetaker organizes your notes by breaking up the audio recording of your lecture into sections. The sections can be tagged with colors making it easy to find important sections when reviewing your notes. PowerPoints, PDF’s or images can be uploaded before or after lecture making it easy to synchronize the audio with specific slides or images. Being able to record audio side by side with PowerPoint slides has been a common positive feedback point. This makes it easy to go back to specific slides and replay what the professor was saying about the information displayed. How can I get Sonocent AudioNotetaker? If you are approved for technology-based notetaking, simply make an appointment with the CSDTech Team. You can do this by contacting your DSP or email the CSDTech Team directly at csdtech@uconn.edu! We look forward to hear from you! Limited licenses available! Available on iOS and Android as well! This entry was posted in Tech Blog.